Bring 3 quarts of salted water to a boil in a large pot, then reduce to a simmer. To form the spaetzle, hold a large holed colander or slotted spoon over the simmering water and push the dough through the holes with a spatula or spoon. If the dough is too sticky to work with, you can work around it by adding 1/4 cup of flour over the dough. Crumble the dough into random pieces with your fingertips to form 'bits' of dough instead of pushing it through a colander or slotted spoon. I found this method to be less messy and less to clean. This random shape is also known as knöpfle type spätzle. Do this in batches so you don't overcrowd the pot. Cook for 3 to 4 minutes or until the spaetzle floats to the surface, stirring gently to prevent sticking. Dump the spaetzle into a colander and give it a quick rinse with cool water. Melt the butter in a large skillet over medium heat and add the spaetzle; tossing to coat. 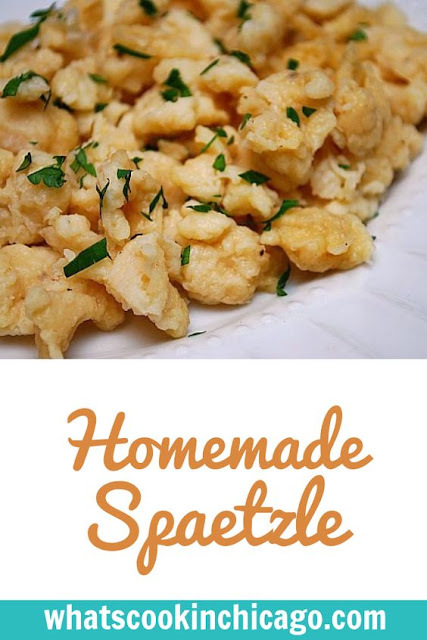 Cook the spaetzle for 1 to 2 minutes to give the noodles some color, and then sprinkle with the chopped chives or parsley and season with salt and pepper before serving. I always season min with poultry seasoning. Yep, this is a traditional Hungarian noodle too - we call it "nukedli" pronounced noo-ked-lee. Only difference is that we don't add the spices but I'm a fan of both of those so I'd be willing to try this recipe with them. I'm glad you wrote out the recipe too.. every time I ask my mom for it she can't even tell me the approximate measurement because she just grew up making it with her mom. So thanks! My boyfriend and I **finally** tried this recipe tonight (I originally saw it when this was first posted). I couldn't believe how easy it was! Thanks for the idea & recipe! It was well worth it to me to buy a real spaetzle maker from Amazon. To buy it ready made is extremely expensive, and the maker only cost the same as two boxes of the commercial product. I make a large batch, cook it in vegetable stock or just water, then dehydrate it and store it in jars so as to have it as an instant "on demand" side dish with any meal.